The other day, I found out that Unibroue came out with a 6 litre version of La fin du monde and 17 Grande Réserve. When I was in Montreal for my last bièrcation in April, they already had 6 litre festive bottles of Unibroue’s nine-percent La fin du monde in stock at Dépanneur Peluso, which is one of the best beer stores in the world according to beer geeks. BC and Alberta recently got the 6 litre versions of La fin du monde and 17 Grande Réserve, they’re incredibly more expensive than their regular versions, as La fin du monde is approximately $149.99 per 6-litre bottle versus $7ish per 750mL bottle and $199.99 per 6L of 17 Grande Réserve versus $9.50 per 750mL of 17. In the end, it’s much more affordable to buy lots of regular 750s of the beer, but if the beer ever comes to Manitoba - this beer will be aimed towards those who want to have the ultimate Quebec beer party with poutine that has curds that actually squeak, crêpes and maple syrup and Robert Charlebois (Google him). A few weeks ago, I mentioned that the Government of Alberta introduced new beer taxes on breweries that aren’t in the New West Partnership (BC, AB, SK). Well, Muskoka Brewery out of Bracebridge, Ontario announced that they were pulling their entire beer selection out of the New West Partnership provinces. Does this currently affect Farmery? I have no idea as Farmery is currently contracted out to Muskoka Brewery, but this still means that one of Canada’s most popular breweries will be losing out on a big segment of the Canadian beer market. For us in Manitoba, we aren’t affected, so we will continue to get Muskoka beers.. unless if there’s a reason that Muskoka believes that Manitoba is discriminatory against Ontario breweries.. I can’t see why we are as we get more beers from mediocre Ontario breweries like Brick than we do from good Quebec breweries like Trou du Diable already. Breweries don’t tend to email me anymore as I’m a nobody, so when Muskoka emailed me letting me know that they were pulling out of the rest of Western Canada, I was surprised someone would actually send an email in my name! Not only that, I was planning on reviewing a beer by the very same brewery! Well, I’m still going to review the beer because.. well, I spent Eight bux on this bottle and it needs to be reviewed! This week I’m checking out Muskoka’s Moonlight Kettle Mosaic Single Hop American Pale Ale. A few of you will recognize the name “Moonlight Kettle” already as it was also a Belgian-style saison that was brought out for the popular Coast to Coaster beer event at Liquor Marts and the Keystone Motor Inn. 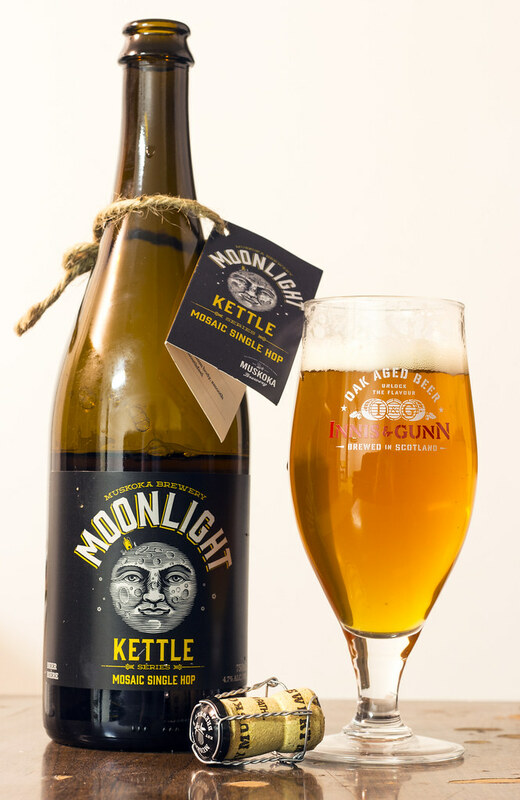 This edition of Moonlight Kettle is more of a hoppy, bitter edition as it’s brewed with mosaic hops, so instead of lemon and orange peel citrus, I expect to see alfalfa, a bit of pine, grapefruit and lemon. Pouring the Moonlight Kettle, it poured a faint yet clearish golden ale, a medium amount of white head that simply sticks to the glass, and a good amount of carbonation in the beer itself. The aroma Is a scent that I haven’t smelled in a long time - it’s an aroma of fruit party platter, I notice a bit of avocado, apple and especially some grapefruit. For it being a Belgian-style ale conditioning in a corked bottle, I got a good hop aroma of pine and fresh cut grass - that’s an aroma that’s always welcome in bottle conditioned ales like this! The taste is a bit earthy, has a bit of a bitter grass taste to it to start off, followed by a beer I can only remember as being something I drank at Hartney Hopper Days some years ago - a faint grapefruit, lemon and barley/wheat beverage that almost doesn’t taste it should be a beer. As the beer warms up, the mosaic hops show up at times, giving off grapefruit and passionfruit flavours, but it’s not giving the bitter pine American Pale Ale flavours I was expecting. It has a light flavour that’s reminiscent of a Sorachi Ace saison…. a hint of dill pickle! At $9.95 per 750mL bottle, Muskoka’s Moonlight Kettle Mosaic Single Hop American Pale Ale is pretty pricey, but it’s a nice bottle conditioned ale that could easily be aged in the bottle for a year or two - but the bitter pine flavours and aromas will be replaced with other flavours and aromas. While the aroma of avocado, apple and grapefruit make it very welcoming, the taste itself is kind of too light for my taste buds.